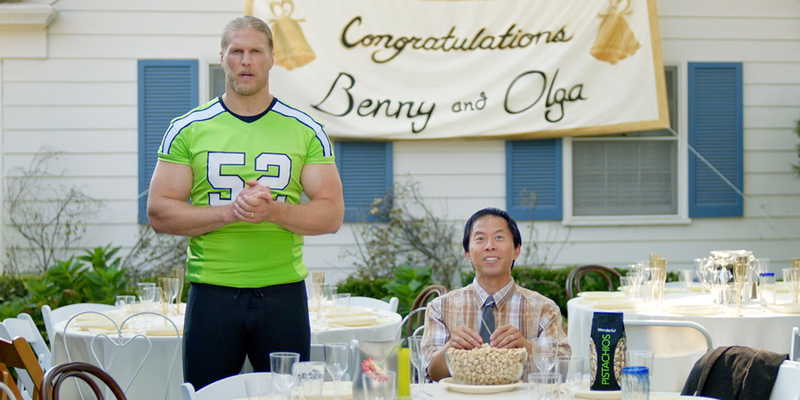 Wonderful Pistachios is launching its largest football campaign to date with a series of darkly comedic ads starring Seattle Seahawks cornerback Richard Sherman and Green Bay Packers linebacker Clay Matthews. The $55 million campaign, titled “Put A Smile on Your Snackface,” follows a series of ads last year starring Sherman, as well as spots featuring John Cena as Ernie the Elephant. The new effort takes the comedy in a decidedly darker direction. A series of ads features individuals who have led almost unfathomably unfortunate lives, yet can’t help but smile while eating Wonderful Pistachios. The ads hinge around absurd scenarios of misfortune, finding comedy in over-the-topic tales of woe, delivered by Sherman and Matthews. Maybe she learned that phrase from his third wife, who ran off with his second wife. A series of other 30- and 15-second spots feature similarly unfortunate individuals, who are still able to bliss out while chowing down on Wonderful Pistachios. Moran returned to Wonderful Agency in May after serving as chief innovation officer for Grey New York, following a previous stint at the brand as interim CCO during which time he developed the “Good Choice, Kid” campaign for Wonderful Halos. For the “Put A Smile on Your Snackface” campaign, Wonderful Agency had their NFL stars picked out before the concept was created, letting the creative team build an idea that entertainingly contrasts the spokesmen’s success. He also wanted to avoid a dry focus on the benefits of eating pistachios. With the “plug and play” concept developed, Moran kept a basket on his desk and required his copywriting team to leave five lines in the basket every day before leaving, including once they started shooting the spots. Moran estimates that while 25 to 30 lines made it into the ads, they wrote close to 1,000. His favorite line in the campaign, the last-second kicker Matthews delivers in “Benny”—”Olga mailed herself back to Russia. No one is coming.”—was written on the spot, and in fact he estimates that nearly a third of the final lines were written on set during shooting. Originally, Wonderful Agency’s “lovable losers” were planned to tell their own stories, but Moran and his writers soon realized it would be better to have Sherman and Matthews functioning as a sort of Greek chorus telling their tales of misfortune while they chomped away, blissfully unaware. Moran said Sherman and Matthews were “awesome guys to work with” and that he actually had to ask them to dial back their professionalism a bit so that their delivery would sound more detached and unpolished.